One of my favorite meals is my Mexican American Breakfast. I wake up early and prepare this tasty breakfast for my husband and I on a weekday or during the weekend. We both love Bigelow #AmericasTea so when #CollectiveBias invited me to participate in this shop I was thrilled with the opportunity. 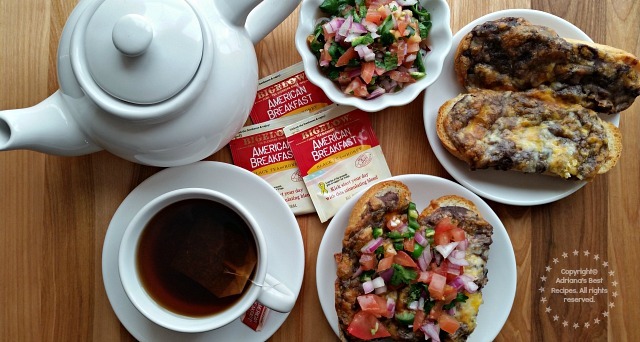 That is why today I want to share with you my Mexican American Breakfast that consist of “molletes”and tea. An easy recipe that brings me so many great memories when I was a teenager and a college student. 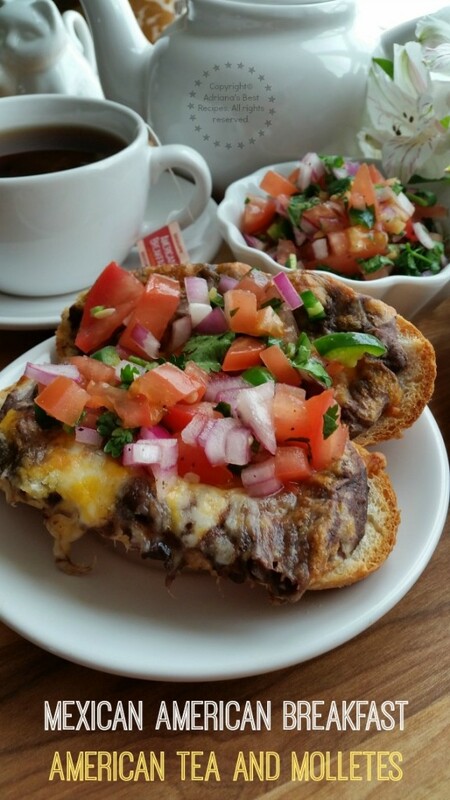 Molletes are a treat that we Mexicans grow up with, it is like a bruschetta but with refried beans and topped with cheese and Mexican salsa over a toasty “bolillo” bread. These flavors go great with the American Breakfast Bigelow Tea that I found at Walmart. Preparation time: 20 minutes. Serves two portions. Cost per serving less than $2.00 dollars depending on the cost of the ingredients at your local supermarket. You will need a chopping block, an oven, knife, spoons and measuring cups. 1.- Start by preparing the salsa see recipe details here. 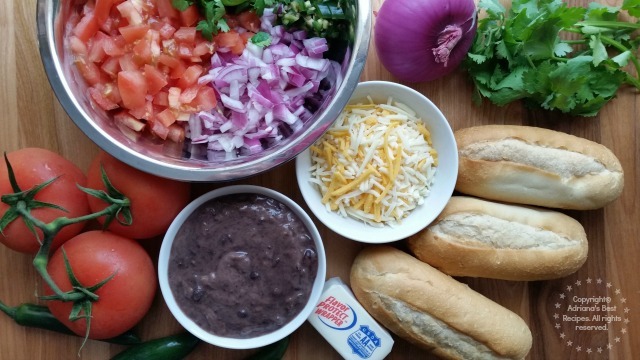 Chop all the ingredients and combine together on a mixing bowl. Drizzle with lemon juice and season with cumin and salt. 2.- Cut the bolillo bread in halves and spread butter on each slice. Then add the refried beans and the shredded cheese. 3.- Bake in the oven for 1o minutes at a temperature of 380 degrees Fahrenheit. 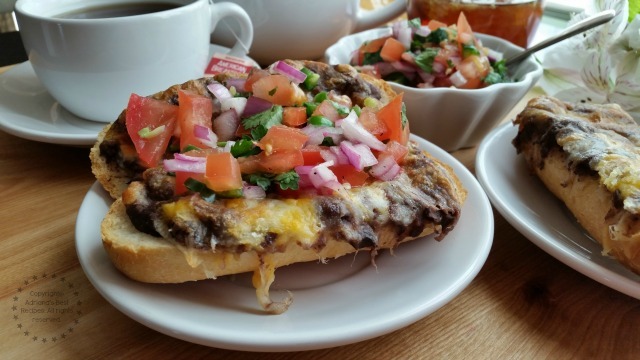 4.- Take out of the oven and serve on a plate, top with Mexican salsa. 5.- Prepare the tea adding one bag of tea in a cup and boiling water. Sweeten to your taste with honey, sugar or sugar substitute. 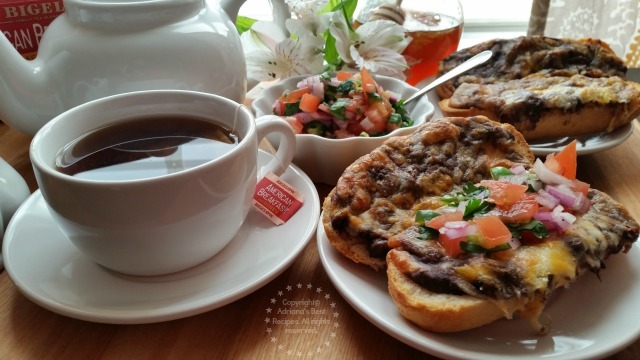 Enjoy this Mexican American Breakfast every morning or during the weekend it is a winner in my family table! 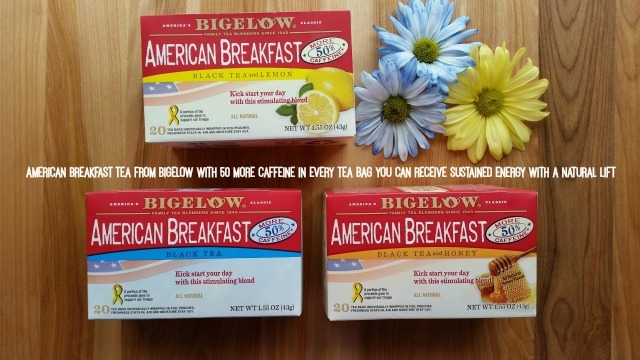 The American Breakfast Bigelow tea comes in three flavors, black tea, black tea with honey and black tea with lemon. These flavorful teas can help you get that extra boost of energy you need to start your day or complete your day since it contains 50% more caffeine and it is crafted with the finest ingredients to create a beautiful cup of tea with a higher caffeine content. And I love to buy it because my purchase helps support our US service men and women, it is a small tribute to give thanks for all they do for us. 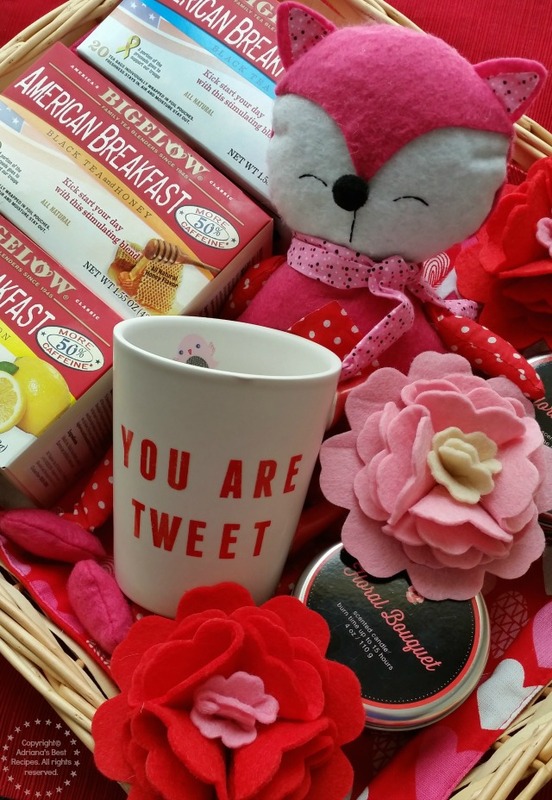 And since Valentine’s is fast approaching what a nice gift would be to receive a care package or a gift basket with American Breakfast Tea from Bigelow and other goodies. This one I will be gifting to my BFF a busy mom like me that appreciates tea and candles! Tea gets help from Theanine, a naturally occurring compound unique to tea. This in combination with caffeine gives you a sustained energy boost along with a feeling of relaxation and focus that only tea can provide. The package includes 20 individually, foil wrapped tea bags with 50% more caffeine in every tea bag. 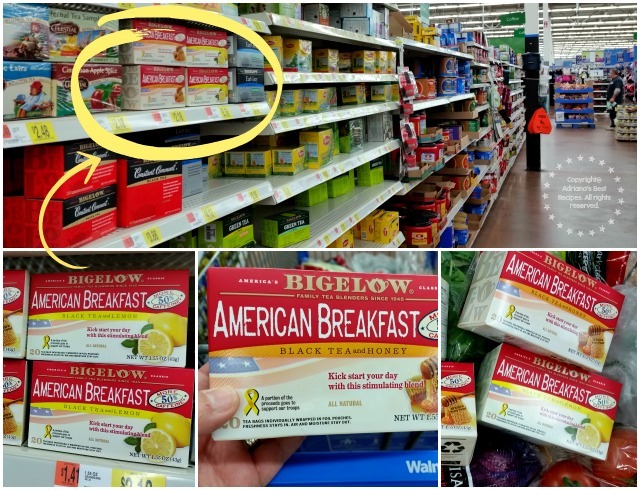 Bigelow Tea is All American, 100% American made by an American Family and the product is available at Walmart. Bigelow Tea’s Charleston Tea Plantation is America’s largest working tea garden. Guests are invited to the Charleston Tea Plantation for weddings, tours and even a variety of music festivals. It’s a tea-riffic way to experience historic Southern culture and a living piece of American history! Almost 4 million bags of tea have been sent to troops overseas with Bigelow’s Tea for Troops program. Your post and the video made me hungry :). Thanks for sharing the recipe with us. Hope it’s been a great week Adriana :). Many thanks Corina you are very kind. I hope you had an amazing weekend too! Esta mañana vi la foto en IG y quedé antojada, y ahora, que estoy llegando a la hora de la cena, quedé hambrienta. Gracias por la receta! Salen muy ricos estos molletes Negra Flor, besos! Muy ricos los molletes y sencillos saludos Daily gracias por tu comentario. Un día de estos voy a sorprender a mi familia con este desayuno, se ve delicioso! Muchas gracias Adriana si preparas este desayuno me avisas que tal les gusto please. Lo quiero todo en esa foto! Vente para el desayuno acá te espero. Qué ricura!! Se me hace agua la boca yo quiero ese desayuno! Gracias Laura muy sencillo desayuno pero lleno de sabor, besos.